I love being able to see artistic influences in artwork. In certain works you can almost track a whole lineage of a design styles in one piece. 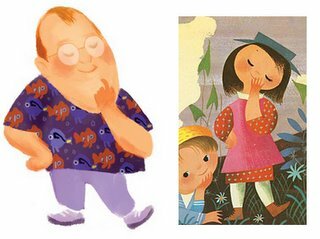 I just happened to come across a mother load of Mary Blair Illustrations at the awesome ASIFA-Hollywood Animation Project Blog, Ronnie Del Carmen recently posted this great caricature of John Lasseter on his blog as a part of an ongoing series of people he works with. Great homage to the Blair style. As a side note i think this Pixar Disney merger is amazing news. I thnk it means we'll get better quality animation across the board and the full $upport of the Disney corporation behind Pixar which is stupendous. Much luck to all involved. Looking at the movement of Disney shares, 50.6% going to Jobs, and Lasseter and Catmull overseeing both companies animation teams, I think you can say Pixar got Disney and Disney paid for it. Wow! Good pull! I'm with you, this Disney/Pixar thing is great news! Can you imagine, Walt Disney Features run by an ARTIST??? Who'da thought. Hey, I love your blog! You have an amazing amount of talent! I especially like the Good, the Bad, the Ugly caricatures! Good eye! I sent your link to Jerry Beck. Thanks for the link to the archive!